The Cumberland & Dumfriesshire Farmers Mart PLC held their final sale of ewes with lambs at foot for the season and the first few pens of store lambs at Longtown on Tuesday 7th July 2009. 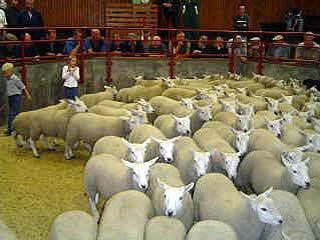 Trade remained brisk for ewes and lambs topping at £50 for Greyface ewes with singles from Murraythwaite. Ewes with twins to £49.50 for Greyfaces from Halton Lea Farm, £43 Murraythwaite. Texels with twins £43 Pennine View. Greyface ewes with singles £48 Murraythwaite. Cheviot ewes with singles £36.50 Pennine View. Store lambs got of to a fine start, selling to a top of £48.50 for Texel x Suffolks from Hopestead who also sold others at £44.50 and £43.50. More could have been sold to advantage.